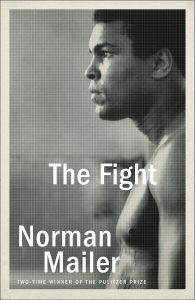 In The Fight, we follow Pulitzer Prize-winning writer Norman Mailer during the suspenseful weeks leading up to 1974’s “Rumble in the Jungle” matchup between Muhammad Ali and George Foreman. Even the most casual of fight fans are familiar with the historic bout, but Mailer unveils a behind-the-scenes story that’ll have readers convinced the fight could go either way by the time the heavyweights step into the ring. The Fight begins with an ode-like chapter on Muhammad Ali, and what it’s like to behold him in person as he trains. From the start, the book paints a picture of a frustrated Ali, bored with training, lacking his usual luster. Held up beside 25-year-old champion George Foreman’s camp, the Louisville Lip immediately assumes the role of underdog in this telling. Mailer writes about himself as a central figure in The Fight. The character Norman is respected by both fighters; by Ali who fancies himself a poet, and Foreman, who’s rumored to be working on a debut book himself. As a member of the press corps, he gains incredible access to the athletes. In one epic chapter, Mailer joins Ali for a run, surprised at the easy pace and short length of the roadwork (the ageing, hungover Mailer even manages to keep up for the first half!). Mailer uses this insider access to look at the fighters — their sparring sessions, their apparent strategies, even their confidence levels — side by side. All signs point to defeat for Ali. The play-by-play of the fight is the most exciting chapter in the book. After a hundred pages detailing sparring, mindset, and training regimens, Mailer watches in awe Ali’s audacity to throw lead right hands in the early rounds. He marvels at the rope-a-dope, and shares the crowd’s mania when Foreman hits the canvas in the eighth round. These pages are some of the best boxing writing in history. Reading The Fight in 2019 (which was first published in 1975) is both joyful and challenging. In our era of too many belts, professional boxing is reckoning with itself; it’s thrilling to read of a time when the whole world would stop to watch a boxing match. On the contrary, much of the prose feels dated in 2019. It’s impossible to write of 1970’s Kinasha an the fight itself without writing of race, but Mailer writes it in big, broad strokes that resonate naive at best and offensive at worst in the current social climate. Most who pick up The Fight already know how that it ends with a victorious Muhammad Ali. The gain in reading it in the twenty-first century doesn’t come from the suspenseful telling, or the lesser-known encounters Norman Mailer had during his time in Zaire. The Rumble in the Jungle had all the makings of an incredible tale: a fallen hero, over-the-top sidekicks, adoring fans with a catchy war cry (Ali, bomaye!). As such, it’s worthwhile to revisit this myth-like boxing story, an enduring one that’s thrilling to consume forty years later and paints a picture of what boxing might once again become.